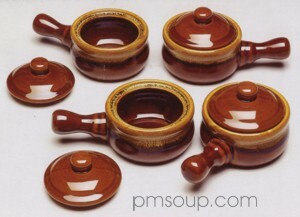 Our ceramic french onion soup crock is the traditional handled style with a lid. It comes in a boxed set of 4. There's plenty of room for soup, toast and cheese. The onion soup bowl also works great as a bean crock. My order hasn't arrived yet, but anyone wondering whether to purchase from this site can feel at ease. I was able to call to increase my order and they called me back in minutes. Looking forward to receiving them. Very kind gentleman took care of my request. We had been looking for these in stores for quite a while. My hubby loves Shepherd Pie and I love French Onion Soup. The larger size of these bowls makes them perfect for layering. They are perfect for our needs and a great price, too! I love these soup bowls! Have bee looking for them for quite awhile and finally got an e-mail they were available. Shipping was phenomenal! Can't wait to uae them for onion soup and to serve chili etc. I have used these several times and I love them. They are broiler safe and keep the soup nice and hot (especially if you use the lids) I would recommend these soup bowls to my family and friends. I even used them when I made Minestrone and wanted to melt some Parma cheese on top. Great bowls! after months of searching i finally found them! nice and deep, and the cheese and bread fit very nicely. wish i had a bigger family so more could enjoy!